Wanted? Email-chat compliant Dekko. Messaging with UBports and beyond? who would like being able to use their regular email accounts for easy to use, free and secure, quick messaging across devices and operating systems? There exists a new email-chat specification, and development versions of the first corresponding messenger app are available, see https://delta.chat. Also K-9 and Thunderbird are getting support to handle the opportunistic encryption of these messages. The delta chat messaging app is already gaining some international popularity, as it makes email so easy to use. Dekko2 looks as it could perfectly integrate a messaging interface within itself. Please have a look at the https://delta.chat website and think of it carefully. As @DanChapman, the author of Dekko wrote "If there's sufficient interest from others as well then we can get it on the road map :-)"
Is it worth the effort? Will people actually use it? Will others also find it perfect to recommend reconsidering email to others? Dekko could make use of the available deltachat-core library (there is a lot of things to consider/implement to make chat and email work nicely side by side) and provide a virtual folder "Chats" that opens a messaging interface (in the right pane on tablets and desktops). The delta chat messenger provides a mobile email client that is as easy to use as a messenger, without requiring central mobile notification servers. It gives people the power to communicate with the entire email world, using their existing email account. The other side does not have to use delta chat. All classic email clients will be able to respond to messages. But the messaging interface may not be appropriate to replace the classic email editing interface in all cases, thus one may require a second MUA app to be installed to handle classic emails, or have both integrated in a single app. Well, if you have access to an android phone, it is probably easier to try it out, than explaining. Personally, I am happy that I found a messenger alternative that allows avoiding the data silos and is at the same time able to reach just about "everybody", through email. And email truly works in the mobile century again, once the other side also installs the "email chat" messenger. IMHO, if Dekko could support this on UBports, we would be in the nice position to be able to exchange messages with virtually anybody and readily recommend delta chat for those on android, and also for iOS once that port is usable. The current android development version is already very usable, although, still only on F-Droid until now. Can you see the generic email chat messaging standard to work out? Please see below and respond with your thoughts and/or vote on the topic. @gnu-mobile Firstly, thanks for trying to gather some interest around your idea. If this was to be implemented in Dekko it wouldn't use the deltachat-core library, as that would be a really intrusive change that will take alot of effort for a library that only supports a subset of what Dekko currently provides. I would rather implement the delta chat specification in Dekko's current libraries as it wouldn't be a massive amount of work to add. 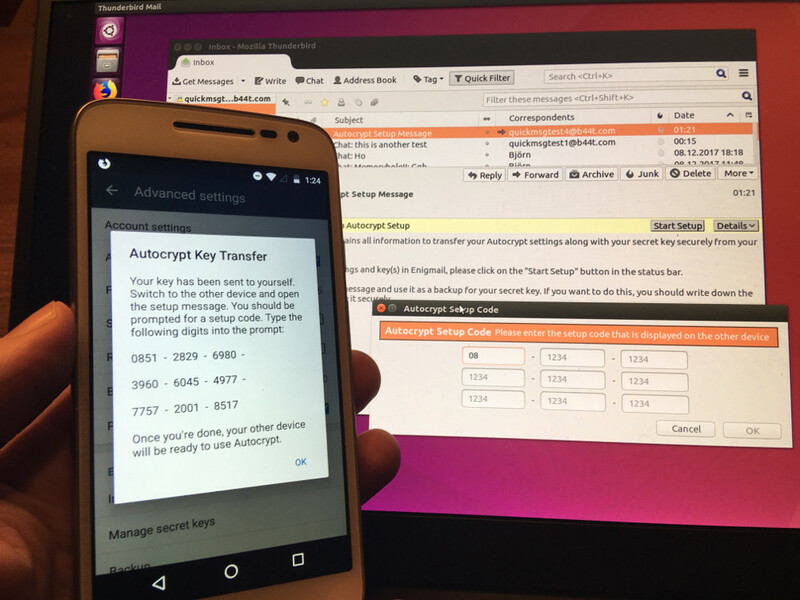 Autocrypt seems very promising and i'm considering adding that as the first pgp implementation for Dekko, I really like this idea of "opportunistic encryption" that gets out the way of the user. Really nice! I think the big issue would be how to separate a chat view from the standard mailbox views. Dekko supports adding filter plugins which process messages before adding them to the mailstore. So we could possibly filter for chat messages and apply flags so they appear in a virtual "Chats" folder. The chat messages would be left in the Inbox folder so they can still be accessed from a standard MUA, and filtered out of Dekko's Inbox views to try and make a clear separation of standard email vs chat threads. I'd be interested to see some mockups of how you (or anyone else) think this should look in Dekko. Also thought the chat/email separation might not be so trivial (therefore suggested the lib) but an advantage of Dekko would be that as it is a full email client, a falsely categorized message could be easily moved. I made a mockup from the screenshots, now. Thought of a new button or virtual folder that lists the current chats in the left pane (the screenshot happens to be from delta chat's long-press-on-chat feature (for archiving or deleting). The right pane shows the opened chat with the messages and text input line. If both re-implementing all the things in Dekko as well as switching backends is too much work, maybe it is easiest to just embed deltachat within Dekko. Looks great, it would be cool to have that implemented to dekko. I'm not sure what you mean by "embed deltachat"? It's not really possible to just embed an android app like it's an iframe or something. This layout isn't possible with dekko's plugin architecture. Where you have placed the delta chat icon in the left side action bar is used to determine which plugin is displayed. So there is a mail plugin which loads the mail views in the reamining window area to the right. It will be the same for calendar, contacts etc when they are complete. Keep the delta chat icon in it;s current location and create a new view (well it will actually be a plugin) that will contain the chats list and chat view but won't have the folder list on the left side. as it's really not needed in this context. Create a "Chats" virtual folder in the left navigation panel. Possibly below "All inboxes" which when selected would open the chats list and chat view like in your mockup. This approach though would mean adding additional complexity to the views that might cause some bother. Personally i'm more in favour of option 1 as it could then be included/installed as an optional plugin. In the future there will be an extensions store but until then it could be shipped with dekko and just need to be enabled by the user. @gnu-mobile yes, let's integrate as mouch as possible into Dekko. why have several apps -one should be able to do the work... eh? This! TouchEmacs for the world! If you have a look at the issue reports, implementing the email chat backend in a way that supports email and chat with a single account as well as separate accounts and multi clients is not a trivial task at all. Also, considering that delta chat is usable but still in beta state, maybe it is better not to re-implement until the best design becomes visible. That's why I thought about "embedding", which might not be the correct term. If qt doesn't provide any way to show external widgets, maybe some bindings could be added to the delta chat client allowing it to be shown/used from within Dekko? I have thought about the two options (icon vs. virtual folder). The folder list could be quite usefull to move messages around, and favor the virtual folder solution. For example, when a spam message gets into a chat (false negative), it would be nice to be able to just drag it away into the spam folder. Or another idea, to be able to drag a received email message into the virtual chat folder to open a chat with the sender or sender+recipient group. Deltachat-core got at least python and node language bindings by now, and even a first command line interface is there.